Sometimes a Winter Wonderland can turn into a winter nightmare. A landscape covered with a fresh blanket of snow can certainly be beautiful, but the process of removing that snow can certainly turn ugly very suddenly. That’s because winter weather is often a prescription for injury. Picking up that shovel makes you particularly susceptible to back injuries and icy conditions can cause slip and fall injuries. At Total Chiropractic Care and Wellness, we often see injuries of this type and we treat back pain on a regular basis. If you’re injured in a slip and fall accident or any other type of mishap such as a car accident, Total Chiropractic can help. We can care for you with post-injury treatment and pain management. We can also teach our patients how to prevent injuring or re-injuring your back or neck. So we want to tell you a bit about avoiding and treating common winter injuries. Snow can be heavy and most people know it can present a danger to your back. “The biggest problem is not just bending,” Minnesota-based Chiropractor John Peterson told the Albert Lea Tribune. “It’s bending and twisting.” Peterson recommends pushing the snow you’re shoveling into a snow bank, rather than lifting the snow. If you do have to lift snow, then an ergonomic shovel with a bend in the handle is recommended. Avoid letting snow pile up. The more often you shovel the smaller the amount you have to move. Bend your knees and use your leg and arm muscles instead of your back. Take frequent breaks and warm up your muscles. 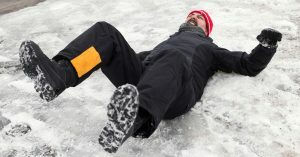 Slipping on ice and falling is another major cause of winter injuries. Dr. Jasmine Carter, a Columbus, Ohio based chiropractor described the various ailments associated with slip and fall to WSYX TV. “Strains in the back or hits on the wrist, elbow, shoulder. You know, pain from that,” she said. She advises that you try to walk in well-lit areas and where people have salted their walkways and driveways. If you do slip and you realize you’re going to fall, try not to land on your hip and avoid using your wrists or elbow to catch yourself from falling. “Best case scenario when you fall, you slide into that fall,” she said. If you suffer a slip and fall injury or if you hurt your back while shoveling, the American Chiropractic Association says spinal manipulation can be an effective treatment. It can reduce your level of pain and you won’t have to resort to opioid prescriptions. Total Chiropractic can help you reduce your pain and strengthen your back muscles in a non-invasive manner. If you have back pain related to winter shoveling or if you’ve sustained an injury as a result of a slip and fall, we can help. Contact us today.